While I was watching my alma mater, Mizzou, play South Carolina in football Saturday, a commercial caught my attention. (Actually, the commercial was one of the high points of the game for me, since the Tigers lost in convincing fashion.) 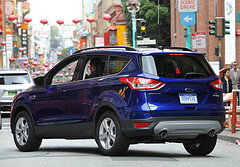 The ad was for the 2013 Ford Escape and highlights its hands-free liftgate, which lets you open and close the back hatch by using your foot. This is possible because of a motion sensor under the rear bumper that is programmed to respond only to a kicking motion. Vince Mahe grew up on two continents and noticed that wherever you go, people have their hands full but their feet free. The result, a liftgate you operate with your foot. Being a fire fighter taught me how to keep calm under pressure and realize there is always a solution. You must keep your calm when collaborating with a team, especially under pressure. . . . The transition to Ford was the same as other transitions I had in my life, like moving from France to the United States. It’s another adaptation I had to make in my life, but I have been happy with it. . . . In Asia, lighter interiors are more desirable. Many people live in huge cities where space is at a premium, so having a light and airy interior is seen as luxurious. In Europe, colours and trim take a lot of influence from the tech industry and are generally darker. Gloss black is a popular choice. Maybe the same kind of attention to cultural tastes was not given to the SUV’s name, which has been used by Ford outside the US since 2008. I didn’t find any explanation from Ford for the origin of the name, but several sites point out that kuga is a Serbo-Croation word for “plague.” No word on whether that has affected sales in Serbia and Croatia. foot operated….how simple and innovative! Yeah, why didn’t I think of it? That’s a great post! Funny enough, right now there’s an engaged discussion on the LinkedIn Creativepool Network about cross-cultural differences and advertising :-). Thanks for stopping by and commenting. And thanks for mentioning the LinkedIn discussion. I took a look – good stuff. You are currently reading Look, Ma, No Hands: An Engineer Brings His Cross-Cultural Creativity to the Ford Escape at Clearing Customs.